To follow are links to various source documents related to TMT’s process in Hawaii. Following a contested case hearing that took seven days over the course of two months, the BLNR issued a Conservation District Use Permit (CDUP) to the University of Hawaii at Hilo for the construction of TMT on Maunakea. In late 2015, the Hawaii Supreme Court invalidated the CDUP issued by the Board of Land and Natural Resources (BLNR) to the University of Hawaii – Hilo to build TMT on Maunakea. At the time the permit was initially granted, a contested case hearing was also approved, as was a stay on construction pending the outcome of the contested case hearing. The Supreme Court returned the case to the Hawaii Circuit Court and instructed that a new contested case hearing be conducted before the Board. The contested case got underway in October 2016. Following 44 days of testimony by 71 witnesses over five months, that hearing concluded in early March 2017. After studying all testimony and data, State Hearings Officer and former Judge Riki May Amano released a 305-page report on July 26, 2017, that recommends a Conservation District Use Permit (CDUP) be issued by the Board of Land and Natural Resources for the TMT project. Amano also noted in her report that the entire process relating to the conservation district use application for the development of the TMT Project “completely negates any argument that the University and TIO could have the requisite specific ill-intent to ‘mistreat’ Mauna Kea. “To the contrary, the participation by the University and TIO in the preparation and consideration of the CDUA and their participation in this proceeding demonstrates the complete opposite: an intent and commitment to participate in a legal process designed to carefully consider the merits of the development of the TMT Project consistent with the eight criteria set forth” for a conservation district use permit on Maunakea,” she wrote. On Thursday, September 28, the State Land Board announced its decision to approve the Conservation District Use Permit to build TMT on Maunakea. In its decision, the Land Board determined that the Thirty Meter Telescope “will not pollute groundwater, will not damage any historic sites, will not harm rare plants or animals, will not release toxic materials, and will not otherwise harm the environment. It will not significantly change the appearance of the summit of Mauna Kea from populated areas on Hawaii Island. The University of Hawaii manages lands on Maunakea including the Maunakea Science Reserve (11,288 acres). The University designated 10,760-acres of the Maunakea Science Reserve as a Natural/Cultural Preservation Area, with no development activity. The remaining 525 acres (5%) of the Science Reserve are designated as an Astronomy Precinct. The Mauna Kea Science Reserve Master Plan—a policy guide for University management of Maunakea, including protection of the cultural, natural, and scientific resources—was adopted by the Board of Regents in June 2000. In 2009 the University developed the Mauna Kea Comprehensive Management Plan, followed in 2010 by the Natural Resources Management Plan, Cultural Resources Management Plan, Public Access Plan, and Decommissioning Plan. These management plans, approved by the State of Hawaii Board of Land and Natural Resources, are the State’s plans for managing Maunakea. The Office of Maunakea Management, together with the Maunakea Management Board and Kahu Ku Mauna share responsibility for implementing these plans. 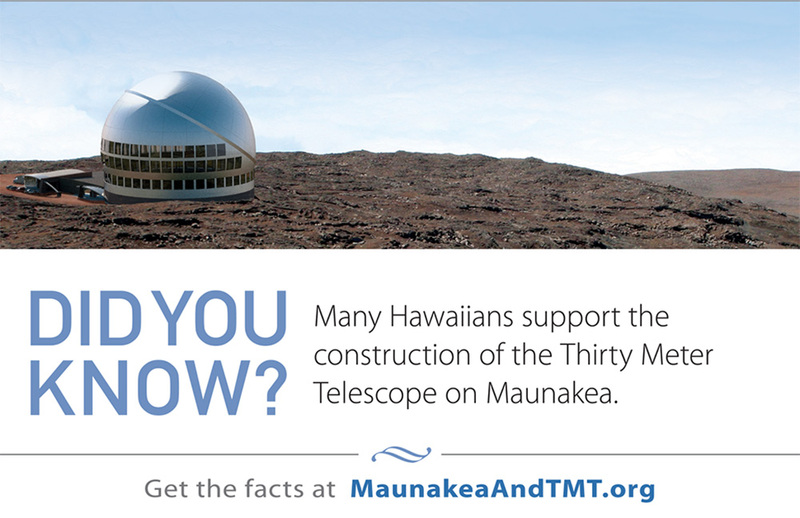 Public support for TMT is growing. A recent Hawaii statewide poll contracted by Pacific Resource Partnership found that 72% of likely voters support TMT on Maunakea, up from 62 percent in 2015. On Hawaii Island, 68% of residents said they favored it, 15 percent more than two years ago. In addition, a statewide poll conducted in 2015 found that 88% of Hawaii residents agree there should be a way for science and Hawaiian culture to co-exist on Maunakea.